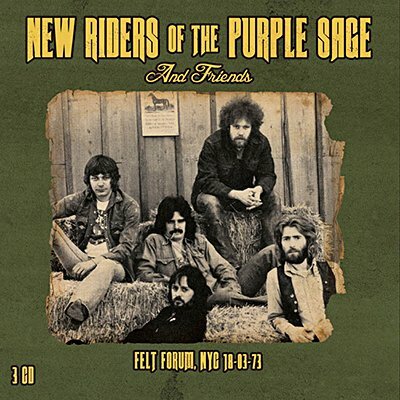 The March 18th performance by the New Riders Of The Purple Sage in 1973 at The Felt Forum, (in the basement of Madison Square Garden) also boasted numerous appearances by 'special friends'. Due to Sons Of Champlin having to pull out, NRPS opened for The Grateful Dead for their remaining performances at the Nassau Coliseum. The Dead returned the favour on their night off by appearing at NRPS' 18th March show sharing the stage throughout with Ramblin' Jack Elliott opening for NRPS. What followed was an explosive and unique performance by two iconic American rock bands. Echoes proudly presents the entire WNEW-FM broadcast of this legendary concert from 18th March 1973 at the Felt Forum, NY. Featuring New Riders of The Purple Sage together with The Grateful Dead and friends. Fully re-mastered with background liners and rare photos.